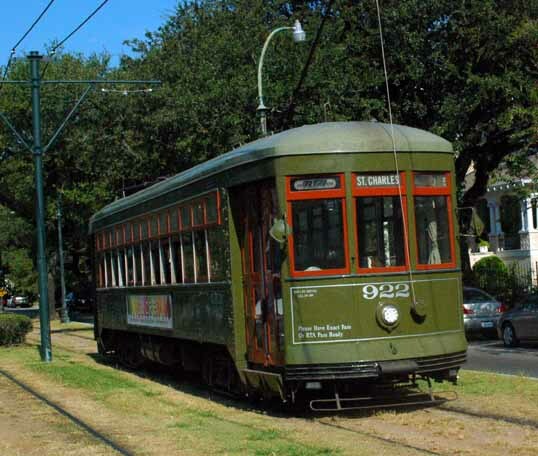 The grandest ride in America was the St. Charles streetcar. 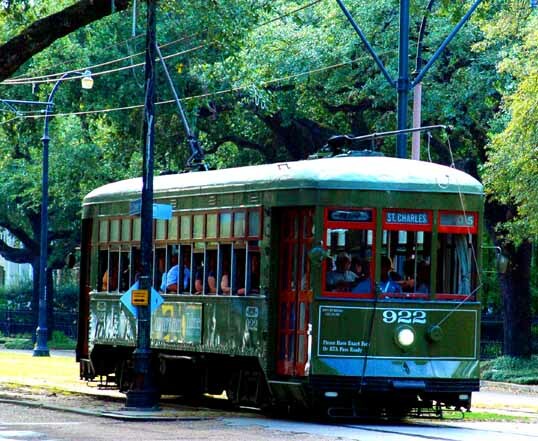 You could catch the old green-painted, lumbering iron car under the colonade in front of the Pearl and for pocket change travel on the neutral ground down arguably the most beautiful street in the western world. The canopy of live oaks over the neutral ground created a green-gold tunnel as far as the eye could see. On the corners, black men sold ice cream and sno’balls from carts with parasols on them, and in the winter the pink and maroon neon on the Katz & Besthoff drugstores glowed like electrified smoke inside the fog. 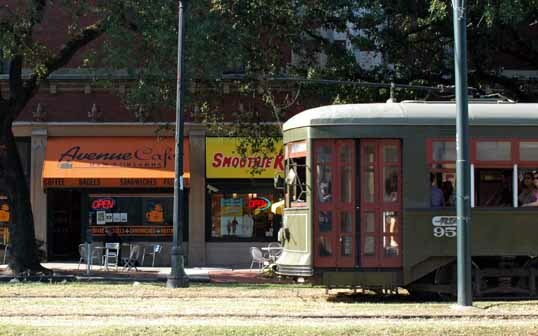 The St. Charles streecar in New Orleans is one of my favorite things in the whole world. If you have never ridden it, put it on your bucket list. Now. The best time to ride the streetcar is at sunset on a hot late summer evening. The windows open and the breeze from the motion sweeps the sweltering afternoon away as the purple sky darkens beyond the southern mansions and ancient oaks. You sit on the wooden seats jostling as the machine tumbles down the neutral ground. The lights flicker mysteriously and each new section of track is greeted with a flash of lightning, a clacking cacophony, and a whiff of ozone from under the wheels. 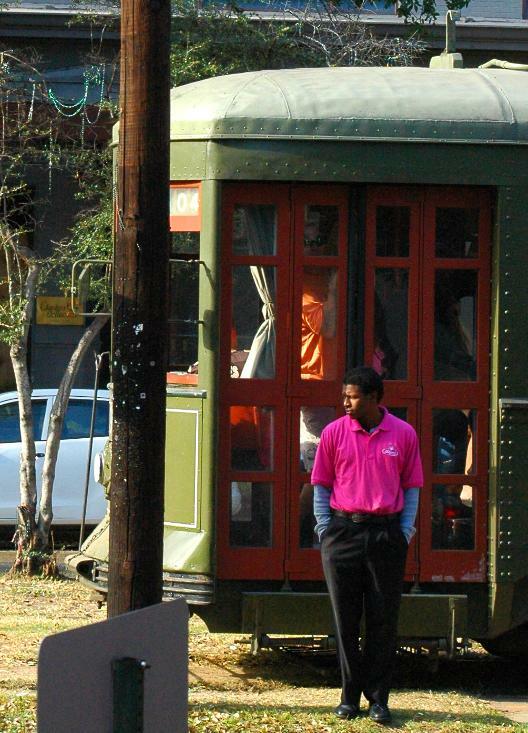 The streetcar becomes a time machine… no… not that… it is a timeless machine. The streetcar is exactly as it was ages ago, the floods, Katrina, countless Krewes from countless parades gone except for the risible plastic beads hanging from the trees, the mansions, the music, the food… all are distilled into a parallel pair of rails and high voltage overhead that lumber from the edge of the French Quarter way out past Tulane and Audubon park. The streetcar is not only a tourist attraction – you share your ride with office drones from downtown banks, lawyers from big firms, and dishwashers nodding off after a long day – the heartbeat of a city brought cheek-to-jowl together. It isn’t very fast – waiting for riders making change at the old-fashioned boxes, drivers bracing themselves to swing heavy levers, stopping at lights while the cross traffic fights out of the way. You can almost walk this fast. But you get there and the getting is everything. 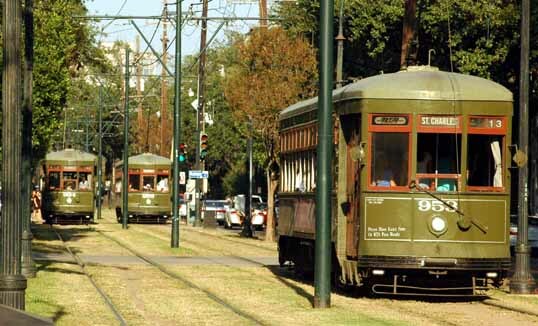 When we are in town we usually stay in a bed and breakfast on St. Charles not far from Tulane and when I wake up in the morning I always like to lay in bed and listen for the streetcars. When you ride them they are all jangling and jump but somehow, from outside, they are smoother, slick steel wheels and sliding commutator sparking along. A bell at the intersections if the cars don’t move fast enough. Like all of New Orleans, it’s hard to figure out why there aren’t more fatalities along the route, with the traffic, walkers, runners all thrown together with few signs and fewer rules. But they get along, somehow. They always do. One of my favorite spots is this unassuming little coffee shop at St. Charles and St. Andrews. I like to sit out front, sip my coffee, and watch the streetcars go by. It was Sunday and the Saints were playing downtown. 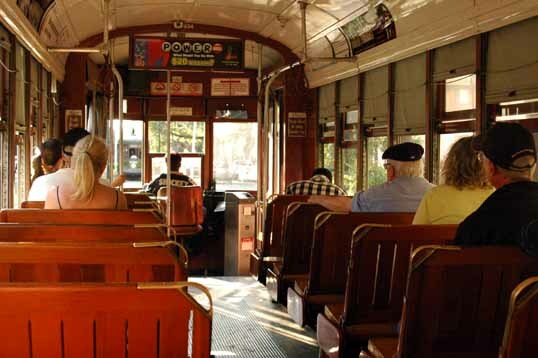 The Saint Charles Streetcar was crowded. Getting off the Saint Charles Streetcar in the Garden District. Everywhere else, the space between the two lanes of traffic on a divided road is called the median. In New Orleans it is called the Neutral Ground. The legend is that it is called this because in the early days when the French lived in the Quarter and the Americans lived in what is now downtown and beyond they would meet in the wide median of Canal Street (named because there was going to be a canal built there – that is why the street and median is so wide – but it never was built) to resolve their differences. Now, all medians in the city are referred to as the “neutral ground.” This is especially important during Mardi Gras, where a lot of people watch the parades from the neutral ground. If you are waiting for a certain person in a Krewe they will tell you if they are on the street side or neutral ground side. 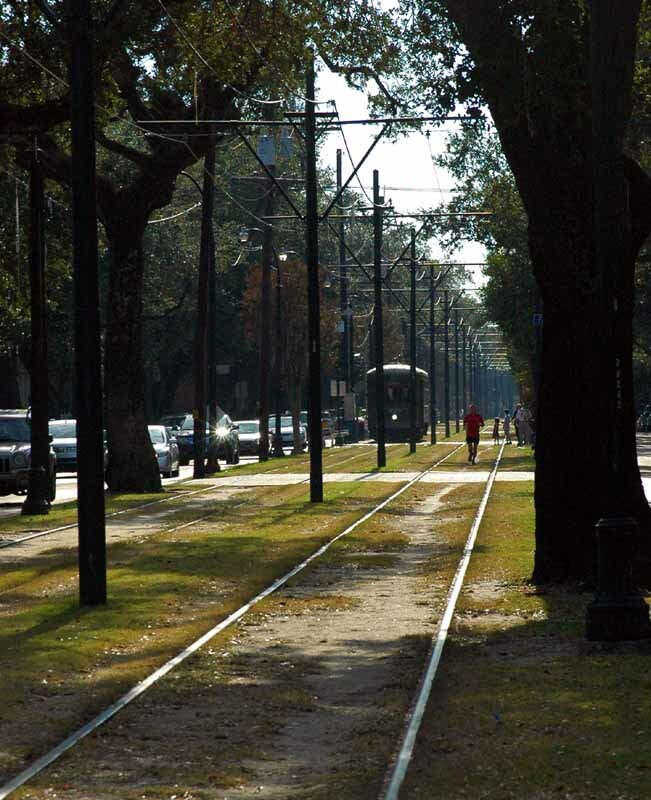 Along Canal Street, Saint Charles (where this picture was taken) and Carrollton Avenue, the streetcars run in the neutral ground. I’ve got some pictures of the Saint Charles Streetcar (one of my favorite things in the world) that I’ll be putting up here. The Saint Charles neutral ground is a wonderful and popular place to go running in New Orleans.